On behalf of all 13 members of the Council, I am very pleased today to move the "Sense of the Council in Support of Litigation Challenging the Constitutionality of the Congressional Prohibition on the District's Ability to Tax All Income Earned Within Its Borders Emergency Declaration Resolution of 2003." Because of the importance of this matter, I am taking the extraordinary step of invoking Council Rule 337 to invite the Mayor of the District of Columbia to join us in the discussion of the resolution which we are considering today. I am pleased the Mayor is here with us today, and I will recognize him to speak shortly. 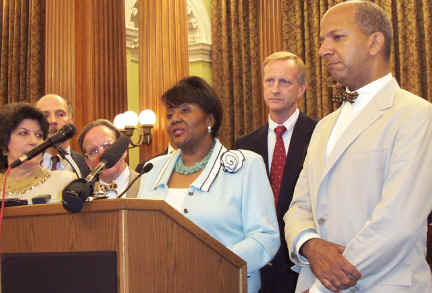 A recent report by the United States General Accounting Office has concluded that a substantial structural imbalance exists in the District's fiscal system, ranging between $470 million and $1.1 billion each year, which requires the District to overtax its residents just to provide an average level of services, and which management improvements cannot offset because the structural imbalance is caused by factors beyond the control of the District. Because nearly two-thirds of the income earned within the District of Columbia is earned by non-residents, the unique Congressional prohibition on a District nonresident income tax has the unique and devastating effect of severely constraining the District's revenue base, which is a primary cause of the District's structural imbalance. No other jurisdiction in the United States is subject to a Congressional prohibition on taxing income earned within its borders. In fact, the universal principle of taxation is to tax income where it is earned, and each and every one of the 41 states in the United States that has an income tax imposes the tax on income earned in the state by residents and non-residents alike. In allowing the District to tax only 34 cents of every dollar earned in the District, the Congress has deprived the District of well over $400 million in revenue every year and sent that revenue instead to other jurisdictions, mostly Maryland and Virginia, which already have a competitive advantage over the District due to the fact that they unlike the District have wealthier suburban areas around their cities that help defray the higher service costs of their urban populations. A tax on income earned by non-residents in the District would eliminate the District's structural imbalance, because the District would have sufficient revenue both to make service and capital improvements and to reduce the tax burden on our own residents and businesses and thereby allow the District to be more competitive with its surrounding jurisdictions. The Council's Committee of the Whole, Committee on Finance and Revenue, Committee on Government Operations and Subcommittee on Public Interest held a public hearing on July 9, 2003, on two bills introduced by all 13 members of the Council: Bill 15-180, the "Commuter Tax Act of 2003", and Bill 15-212 the "District Government Nonresidents Employees Tax Act of 2003". Both bills are prohibited from taking effect unless the Congress or the Courts take action to allow their enactment by the Council. At the public hearing, testimony was presented documenting the discriminatory nature of the Congressional prohibition against a District nonresident income tax, and the harm caused to the District government and its residents by the prohibition. A lawsuit will be filed shortly by District taxpayers challenging the constitutionality of the unique Congressional prohibition against a District non-resident income tax. It is of vital importance that the Council and the Mayor promptly take the steps necessary to join as plaintiffs in this lawsuit to seek a declaration that the Congressional prohibition is unconstitutional. First, we believe that the Prohibition against a nonresident income tax is unconstitutional, and we want to pass the tax, and only the Courts can tell the Council and Mayor whether we have the authority to do so, whether in fact the Prohibition is unconstitutional..., so we have a direct need for the Courts to advise us on this matter. Second, because of the lack of Congressional voting representation, which all of us believe is what has led in part to this Prohibition, we don't have full democratic remedies through the Congress on issues like this, and so once again we need to resort to the Courts to get full protection for the constitutional rights of our citizens and the prerogatives of the citizens' elected leaders.